Trade 2 Bathurst 1000 – win the ultimate VIP prize worth over $80K! | Pedders Suspension – The Car Suspension Specialists! 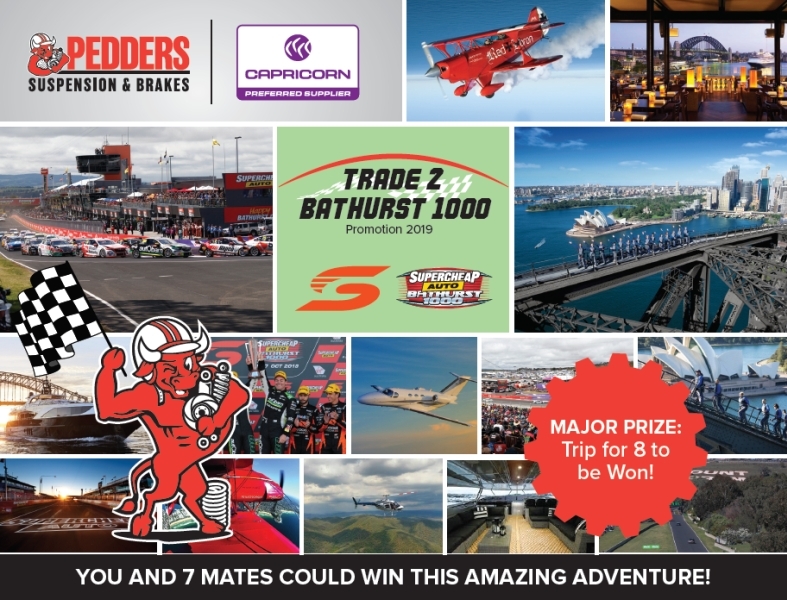 Pedders Suspension & Brakes has launched its latest trade promotion; Trade 2 Bathurst 1000 which will give one trade customer – and 7 of their lucky mates – the chance to win a once-in-a-lifetime experience at the 2019 Bathurst 1000! The major prize winner in the Trade 2 Bathurst 1000 promotion will win for themselves and 7 lucky mates an amazing prize spanning four days and culminating in the ultimate VIP experience at this year’s Bathurst 1000 – a total prize worth of over $80,000. In addition to the major prize, Pedders will also be giving away a $3,000 Sportsnet holiday voucher to one lucky winner per month during the promotion. No Bull! Eligible entrants must spend $100 (including GST) or more in one transaction at any participating Pedders Suspension & Brakes outlet between 1 April and 16 August 2019. One ‘entry ticket’ will be awarded for every $100 including GST spent, with entrants needing to register their ticket number on the Trade 2 Bathurst 1000 website before the promotion ends to go into the prize draw. Full details and terms and conditions for the Trade 2 Bathurst 1000 promotion can be found in the Trade 2 Bathurst 1000 Promotional Flyer.